#1 ISSAC! Considered moderate queue when we first arrived. The queue was so much longer when we left. #2 Bite your own toast! No cutting! 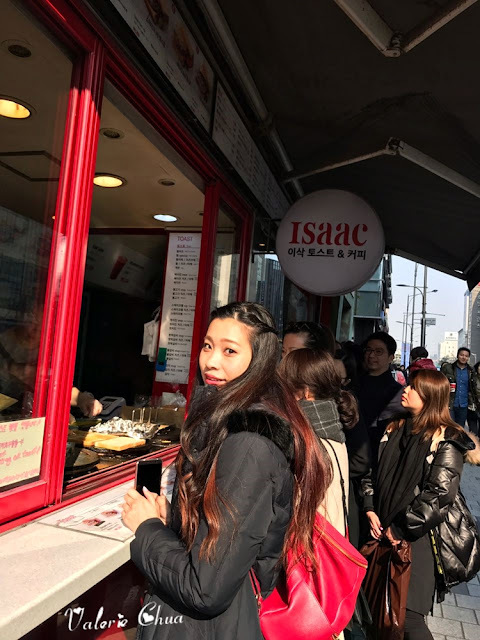 Seoul - Birthday Celebration & Wedding Proposal!!! After having fun at Hello Kitty Cafe in the afternoon, my man brought me to an awesome place called Jangtugaree located at Sinsa for my birthday dinner. #1 So European interior with artistic paintings, lighting and even furnitures. #2 It was full house that time. #3 Can't wait to eat!! #4 Fresh Salad with Perilla Dressing, complementary side dish when you ordered Original Grill Pork Belly. Not the typical salad where you always need to save up for the sauce, just in case those vegetables becomes too dry at the last few bit. We ate the sauce like it is soup. Scoop and slurp. #5 Mashed Potato with Cheese, another complementary side dish. There is no brown sauce like the typical mashed potato we had. The texture is not those super smooth one like machine made, this is definitely handmade mashed potato. #6 Baked Tofu with Cheese. This is super yummy! The tofu was so soft and the cheese was so sinful yet delicious! Must try!! Birthday girl woke up in very exciting mood because Hello Kitty Cafe, here I come!!! 😍😍 There are few Hello Kitty Cafe but I have decided to visit the one in Hongdae because it is the biggest one among all. #1 One Piece lovers, SCREAM!!!! My man was very happy to saw this! Hahaha! We accidentally found this when we were looking for the Hello Kitty Cafe. 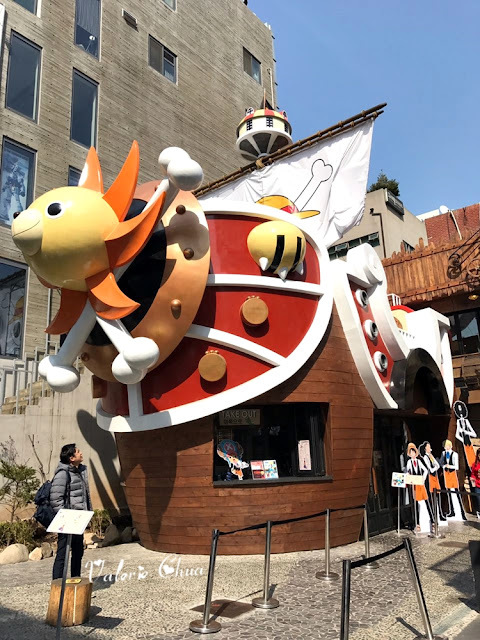 This is a One Piece Cafe and merchandises store. #2 Always love red bricks being incorporated in the architecture. A snapshot of my birthday OOTD. Thank you MODO for such a pretty top and skirt. Scroll down to see the top as this one covered up by the jacket and wool scarf. #3 Oh I found you! Welcome to Hello Kitty Cafe!! Big Bow at the entrance that sure catch your attention! #5 Can't wait can't wait!!! #8 Can't believe I am here!! #9 Hello Kitty statue that welcomed us at the glass door entrance.